Oh so-lush lavender - it’s the stuff hair goals are made of. From grey-lavender hues, to purple pastel perfection, there’s bound to be a lavender hue for you. This ‘do will look equally at home with that Summer festival get-up or for adding extra interest at Winter. Who Does Lavender Hair Suit? Lavender hair is really versatile and complements lots of tones. But it’s most suited for those with light brown or hazel eyes, as it flatters brown hues and gives added depth of colour. Light Purple hair is perfect if you want to draw attention to your eyes, as the white of the eye will contrast with the purple, making them gleam and the brown hue really pop. You can read more about which hair colours suit your eye colour here! Whether you have a cool or warm skin tone, lavender will suit both down to a T! more than one if you’ve got long/thick hair). To get a lavender shade, you’ll need to start with a light blonde base tone. If you haven’t already got lightened or natural light blonde hair, now’s the time to get pre-lightening with one of our LIVE Intense Lighteners. If you’ve already got colour on your hair, you may need to grow this out before attempting to bleach at home (depending on your current shade and frequency of dyeing). For some tailored tips and advice on this you can always have a quick chat with our Advisory team on Freephone 0800 328 9214. Your hair should be clean and damp before your start and you’ll need to wear the in-pack gloves, and have an old towel around the shoulders to help prevent staining. Putting some petroleum jelly on your hairline and around your ears will also help to stop any skin from getting coloured. In a non-metallic bowl, mix some of the Purple Punk with the in-pack conditioner or new LIVE Pastel It! to create a pastel shade - the more conditioner added, the more pastel the shade will become, so it’s up to you how light you want your purple hair. Apply the mixture evenly all over your hair. Wait for up to 5 minutes to let the pastel colour develop, then rinse your hair until the water is running clear and finish with the conditioner for nourished hair. For permanent lavender hair, you should use our LIVE Lightener + Twist Cool Lilac shade. This will lighten and colour hair in one simple step and is designed to be used on naturally blonde hair, so isn’t suitable for pre-lightened/coloured hair. Be sure to read the Instruction Leaflet before colouring and don’t forget to perform a strand test. If you’re unsure of how to do a strand test, read our article here. Combine the Developer Lotion with the Colour Cream, shake well and apply to dry, unwashed hair, massaging it evenly from the roots to the tips. Leave to develop for 30-45 mins. To keep that light purple hair looking as lush as possible, make sure you don’t over-wash your hair, and only use shampoos or conditioners designed for coloured hair, like our Color Expert Colour Sealer Conditioner. Our semi-permanent Purple Punk shade mixed with conditioner can also be used for an easy, in-shower colour top up - check out our video here for the method. Don’t forget, you can always save any of the Ultra Brights Colour Cream that you don’t use for the next time, just screw the lid back on nice and tight. Remember when those roots do start to appear, only lighten your natural root colour - no need to do your entire head of hair. And you’ve got that lavender look down to perfection. Be sure to tag those dreamy hair selfies with #LIVEColour for the chance to appear on our Insta. 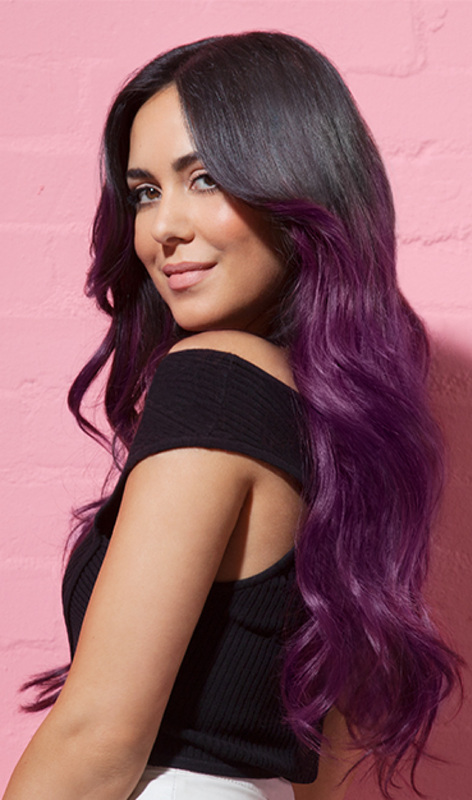 Simply mix the Purple Punk colour cream with the in-pack conditioner or LIVE Pastel It! Lilac Twist! Use our LIVE Pastel Spray Icy Blue and Cotton Candy and apply the colours to alternate strands of hair for a lilac twist.